0% meat, 0% soy, 0% gluten, but 100% great FLAVOR! 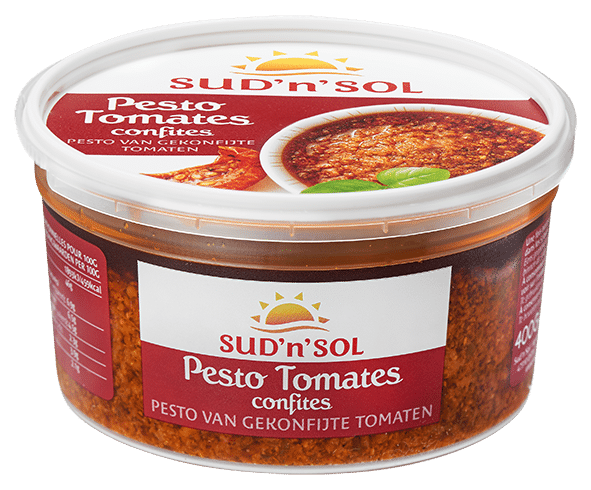 Sud’n’Sol revisits the traditional Bolognese sauce, putting all its know-how and love of vegetables in this range of Veggie Bolo’. The Veggie Bolo’ are composed of 100% natural and vegetarian ingredients. Ideal for making pasta, toast or hot sandwiches. 100% VEGGIE, gourmet and balanced, the Veggie Bolo’ replace the traditional ground meat with pea proteins. 0% meat, 0% soy, 0% gluten, but 100% great taste! Tomatoes (semi-dried tomatoes 62%, tomato paste), pea protein rehydrated, vegetable oils (rapeseed and sunflower), water, onions, basil, carrots, salt, garlic, concentrated lemon juice, red peppers, pepper, sugar, oregano. Mixed vegetable (grilled eggplant 62%, demi-dried tomatoes, grilled onions), vegetable oils (rapeseed and sunflower), rehydrated pea protein, tomato paste, water, basil, salt, lemon juice concenter, garlic, sugar. 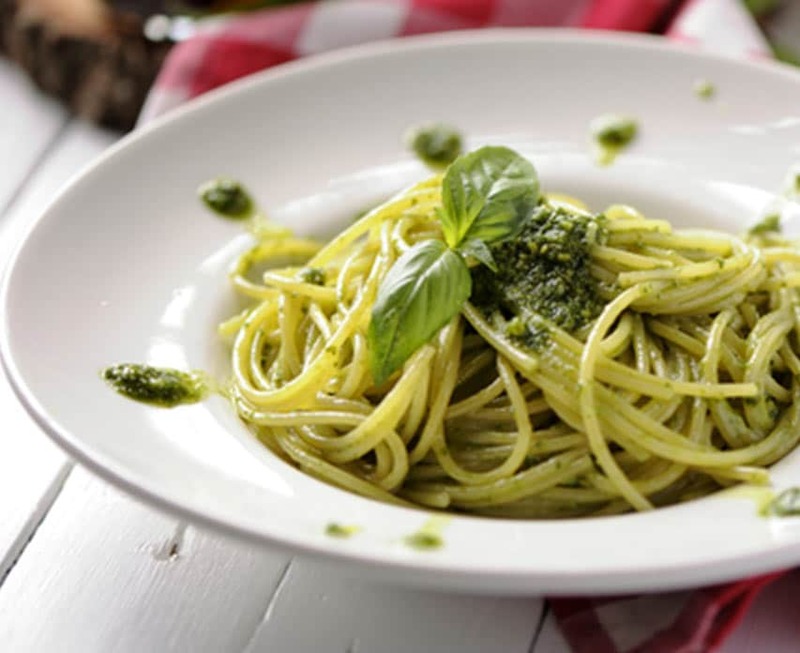 The pesto is prepared with rapeseed oil, which allows a 100% natural product conservation while preserving the flavors of the basil. Also available in small size of 150g. Look in the menu under Pesto. The Sud’n’Sol Tomato Pesto’ is a tasty sauce with semi-dried tomatoes and Mediterranean flavors. Prepared from fresh tomatoes, semi-dried and mixed with oils and herbs steeped in Mediterranean flavors, they will brighten all your dishes. Tomato (tomato concentrate 57%, semi-dried tomato 43%), sunflower oil, olive oil, basil, peppers, cheese (milk, salt, starter, rennet), salt, garlic, sugar, oregano. 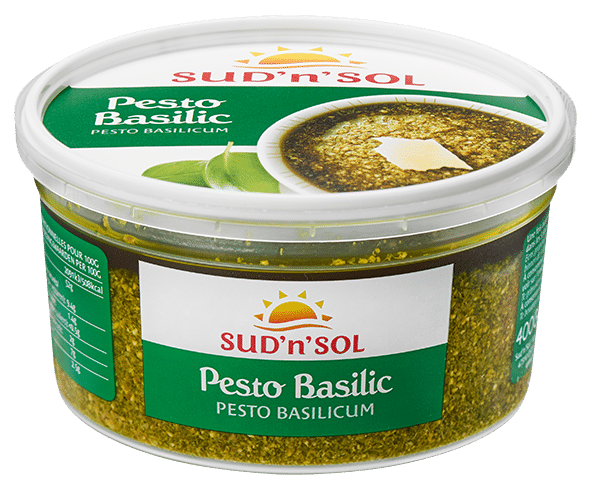 The Sud’n’Sol Basil Pesto’ is a tasty sauce with basil and Mediterranean flavors. Prepared from fresh basil mixed with oils and herbs steeped in Mediterranean flavors, they will brighten all your dishes. Sunflower oil, basil, cheese (milk, salt, lactic ferment, rennet), salt, concentrated lemon juice, garlic.